Hinduism believes in worshipping a particular deity for a specific purpose It doesn’t simply stop with a mere invocation to the devatas. It does have an impact if the deities be pleased with the offerings through a ritual called Homam. There are different types of homams according to each specific purpose. The process starts with erecting a homa kundam, a temporary make-shift small pit in a square shape built with bricks. In this fire altar (homa kundam), the holy fire is stoked with ghee. The Vedic Brahmins chant manthras while consecrating food, clothes, grains and desired objects of the deity into the fire, which could reach Him directly is the belief of Hindus. It does stand as a remedy for the particular problem for which it is made. Here we list some of the homams and their purposes. 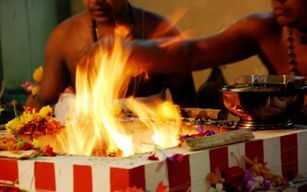 To get recovered from chronic illness and to drive away the evil spirit from the person’s body this homam is performed. Longevity and well-being will be restored by performing this homam. To recover from Balarishtam within 17 year old. It is meant for kids life dosha. To get relieved from a planetary doshas, this homam is suggested. If you are struck by thunder and lightning, do this. It relieves your crisis (gandam), disease and ancestral curse (pithru dosham) if any. If you need political influence or if you struggle from ancestral curse perform this. To get rid of Paranoia. It helps farming to flourish. Your debts will be cleared. You get relieved of the loss of land or progeny. It is performed for successful education, to get amicable settlement in family disputes and to get recovered from heart ailments. It does fetch you hale and healthy life and multifarious goodness. If you can’t stay in one place and wander around restlessly, you perform this. Your problem will be solved. Nightmares disturbance can be rid of by this pooja. Your fear and confused state will disappear if you do this homam. Lung related ailments, wounds, long gash will be cured by this. Karma, Pithru dosham, dosham due to the torture of birds and animals or kids will be relieved. For still born babies (baby dies in the womb) you perform this to relieve of in future. It relieves you of myriad kinds of illness. Buffalos are offered to others as a recovery. To get relieved from the impediments in child birth. A baby placed on a winnow (or in a plate) to see a cow’s face. Magam, Chithrai, Rohini, Poosam, Ashwini, Revathi, Ayilyam and Moolam have dosha’s to perform this. Golden cow offerings could help recovering from barrenness or miscarriages during pregnancy. It is for kids welfare. To get relieved from evil spirits haunting the house. It helps land related problems and removes negative energy. To get rid of fear and to drive away evil spirits you perform this. Relieves you of all kinds of sins and curses. For triumph and to remove of enmity or hospitality. At the age of 70 you do this for your welfare. If there are Honey combs at house, perform this. #3/5, Eswaran Koil St, West Mambalam, Chennai-600 033. India. email: futureteller.yogi@gmail.com ©2015 All Rights Reserved.